The Holiday Inn Express Van Nuys Hotel is located in the heart of the San Fernando Valley, just off the I-405 Freeway at Roscoe Blvd. exit, close to Anheuser Busch, Galpin Motors, Van Nuys Court House, Van Nuys Airport, California State University Northridge (CSUN). We are centrally located near all Southern California Attractions including: Universal Studios, Disneyland and Huntington Gardens. 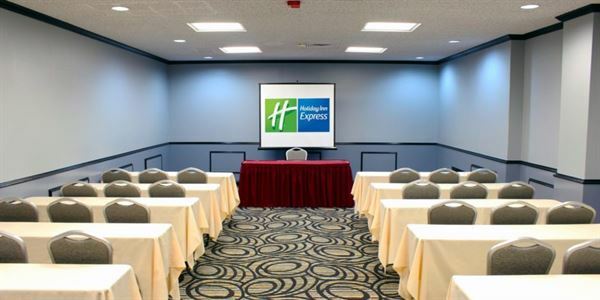 The Holiday Inn Express Van Nuys Hotel offers 132 guests rooms including 6 Jr. suites. Each with a spacious work area with wireless DSL, personal voice mail service, coffee maker, iron/ironing board, hair dryer, 25' television with remote access and offering in-room pay-per-view movies for you to enjoy and Nintendo games for the kids! The hotel offers an elaborate complimentary Continental Breakfast, complimentary parking. Relax, feel great and take advantage of our outdoor heated swimming pool, or enjoy our 24hr. fitness center with state-of-the-art equipment. Special Features: High Speed Internet Access, Telephone With Voice Mail.